When triggered by an alarm system, the ENFORCER Voice Dialer can call up to 5 numbers and deliver a user-recorded 20-second voice message, playing repeatedly for one minute. The receiver can then listen in or broadcast a message to the room occupants or can disarm the system. The dialer includes a home mode (acting like a door chime when the owner is present) and a panic button. The 105dB built-in siren alarm can be programmed on or off. 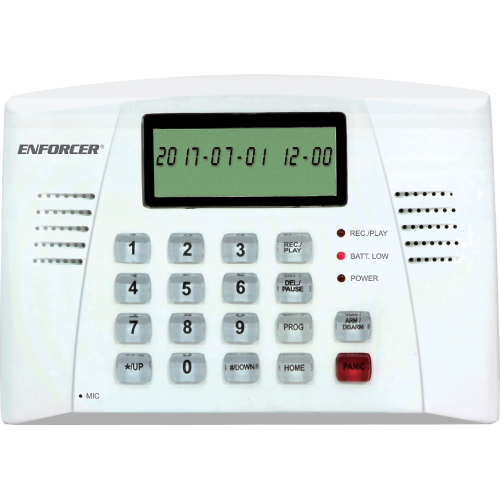 Trigger-activated alarm and dialer with user-programmable 20-second alarm message.